HarePoint Analytics with data ranges comparing feature. 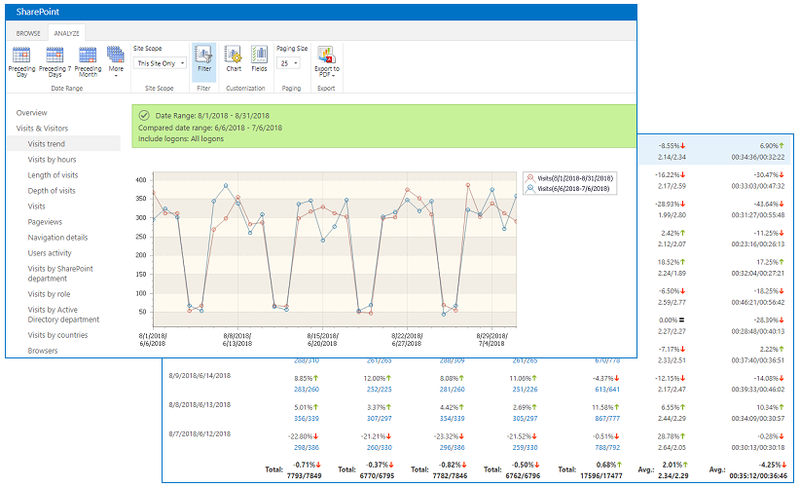 New version of HarePoint Analytics for SharePoint is released! Meet the new version of HarePoint Analytics for SharePoint - the industry-leading solution for gathering detailed information about your SharePoint sites: visitors and their behaviour, traffic flows and trends, content popularity and relevance, document usage and 90+ other reports provide you all possible information needed to understand how your portal really works. There is a prime new feature in the new version of the HarePoint Analytics - comparison of two data sets over different time frames in a single report. The feature of selecting and comparing date ranges makes the solution a ‘true analytics' tool for all users: comparing reports can demonstrate the difference between selected periods visually - on graphs as well as provide details about changes in the report data tables. In one glance at the resulting report makes the changes between the two periods obvious. Thus we have an ideal tool for rapid and demonstrative illustration of data for different periods that's suitable both for express-analysis and for fundamental research. content type data is collected for documents now. 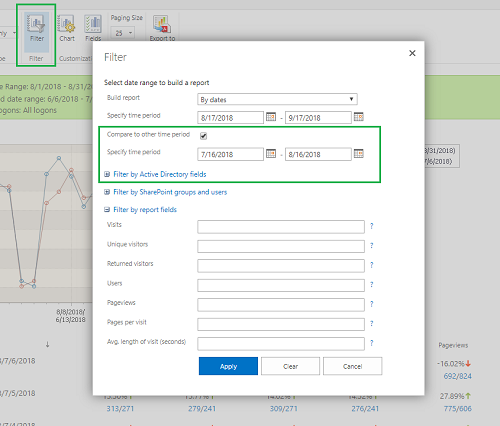 As always, the full list of improvements and fixes is available in the Version History section; and you are welcome to get the new version of the product on the HarePoint Analytics for SharePoint homepage or contact us with any corresponding questions.